This was the second Rosena Ranch Circuit Race of the season and it was a shorter version of the same course of the previous edition. The shorter course was equally as hard given the wind, small rollers and sprinting out of every turn around. In the Pro 1/2 race, the field was about 40-50 riders strong. The SoCalCycling.com Team, SPY/Ride/Giant, Bike Religion and PAA/Empire Bikes had three to four riders a piece, so this was how the race was dictated with each team being represented in the winning move. Right from the gun, Patrik Ericsson (PAA/Empire Bikes) started things off with Efren Flores (SPY/Ride/Giant) and Robert Angle (Bike Religion) following the move. The gap opened up to about 30 to 40 seconds very quickly. This left the SoCalCycling.com Team to do the work and bring the break to a bridgeable margin. Brian McCulloch (KHS/ Maxxis/JL Velo) was the first to take advantage and shoot across to the break first. Then on the back side of the course, Zane Torre (SoCalCycling.com) was able to bridge across as well to complete the break. Once the break swelled to 5 riders that had all the teams represented, it quickly opened up to 1:30. With most of the riders taking consistent pulls this would be the final move of the day. Some riders made huge efforts to solo across to no avail. As the race went on, the break was solid as the winner would come from this break. The field finally broke apart with three laps to go and saw a second group form with some riders in between the break and a split in the field. Patrik Ericsson (PAA/Empire Bikes) made the first move, then Efren Flores (SPY/Ride/Giant) was able to capitalize once Ericsson was caught and came home solo for the win with the remaining break about 10 seconds behind. 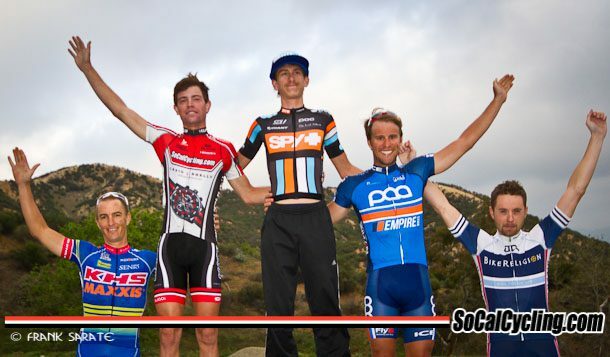 Zane Torre (SoCalCycling.com) took the sprint for 2nd and Patrik Ericsson was 3rd.